Increase your fitness and activate your fat burning. Train comfortably and safely with a big running surface. The taller the user (and thus the stride length) and the quicker you run on the treadmill, the taller should be the running surface. Our range of products offers you treadmills with an appropriately wide running surface exclusively. You only need to choose the desired length. Some trampolines are equipped with a space-efficient folding mechanism, which makes the machine folding and easy to store away. The stronger the motor of the treadmill, the quicker it reacts to speed changes while running. A strong motor has a long durability and always performs optimally even for high incline and heavy users. Treadmills for home use are designed for private use. Semi-professional treadmills are designed for a longer operating live and can also be used at hotels, clubs, and for company's fitness. Treadmills of commercial quality are best for professional use at gyms and for a very long operating life. 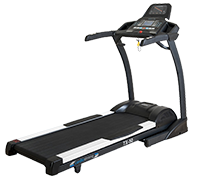 Semi-professional and professional treadmills are excellent for home use due to their high-grade material quality. Being developed for ambitious runners, the Performance series of Tunturi offers a good price-performance ratio. The solid workmanship, the intuitive LCD display, and the options of connection with tablet or smartphone ensure an exciting and diversified training. Compared to the Performance T50, the T60 is equipped with a stronger motor and a maximum running speed of 20 km/h. 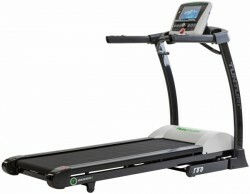 The Tunturi treadmill Endurance T80 is the top model of the new Tunturi treadmill Series. The Endurcance T80 is designed for very ambitious athletes at home as well as for the semi-professional use. The strong motor and the Full Color TFT-LCD display are two outstanding features. The comfort is very special due to the strong motor, a 3 mm running mat, and an easy usability. 28 programmes are available for the user. These can be quickly set and varied thanks to the intuitive and easy use. With a maximum user weight of 150 kg, this treadmill is very sturdy and also suitable for heavier runners. The stable frame and the strong motor offer a smooth and silent running experience even during more intensive training sessions. The Performance Series of Tunturi is developed for the already active and ambitious runner. The solid workmanship and the LCD display offer an easy and reliable use. 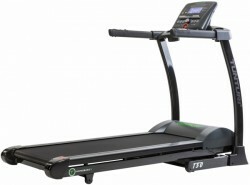 The Tunturi treadmill Performance T50 convinces by its console and the connection options to smartphone and tablet. The Tunturi treadmill Competence T20 is the beginner model of the new Tunturi Cardio line for treadmills. It is well suitable for home use and is equipped with all necessary features to create a good and healthy workout. The LCD Mono Color display shows quickly and clearly all training data. All in all, 14 programmes are available, of it two heart rate programmes. 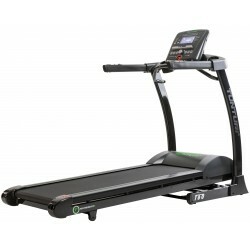 The Tunturi treadmill Competence T40 is a good treadmill for beginners, who train regularly. Using this treadmill, you increase your well-being and your physical fitness. The easy operation is especially user-friendly and intuitive. Thanks to the Bluetooth interface, you can connect your tablet with the equipment and turn the treadmill into an interactive training machine. The equipment of a treadmill includes, among other things, motor output, size and quality of running surface.These provide a more comfortable motion and more safety for higher speeds respectively taller runners. A pc with many training programs offers more diversion while exercising. Extras like hot keys, folding mechanism, fan, and transport wheels make your workout much more comfortable. Besides the frame construction, own weight and siize of standing surface guarantee a great stability. The more stable a treadmill is, the higher is the maximum weight load capacity and the more durable becomes the machine. Treadmills of high stability stand much safer for intensive training sessions. Furthermore, big rollers reduce wear and tear of the whole drive system. Motor output, type of running mat, shock absorbers, and frame construction contribute to the running smoothness. An equipment of good running smoothness hardly causes any background noises and you can listen to music or watch tv while exercising. Thickness of running mat and number as well as quality of shock absorbers are important for shock absorption features of a treadmill. A good absorption is joint-gentle and prevents early signs of tiredness. 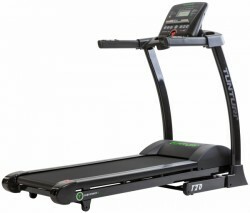 Tunturi belongs to the pioneers of the production of treadmills. The Finnish company develops high-quality treadmills based on their experience of many years, which are designed for leisure sportsmen as well as professional sportsmen. The treadmill training is extremely effective, when it is meant for calories burning. Doing a treadmill training, you improve your physical fitness and train actively your leg and back muscles. The Tunturi treadmills are equipped with an orthopedic running mat, which has excellent absorption features and which offers you a very joint-gentle training. Buying models of the Pure series, you get innovative technology with an outstanding quality. The models are equipped with strong motors, which are extremely durable and powerful. The Finns have designed a treadmill of puristic look, which is a real eyecatcher for every room. The Tunturi treadmill Pure Run 10.1 is especially individually adapted to your needs and offers you a first-class iPure touch screen console and a multitude of excellent training programmes for a very varied training. Hence, the treadmills of Tunturi offer a first-class running condition, combined with Scandinavian design and puristic look.